Let me tell you – we were first in and first out! 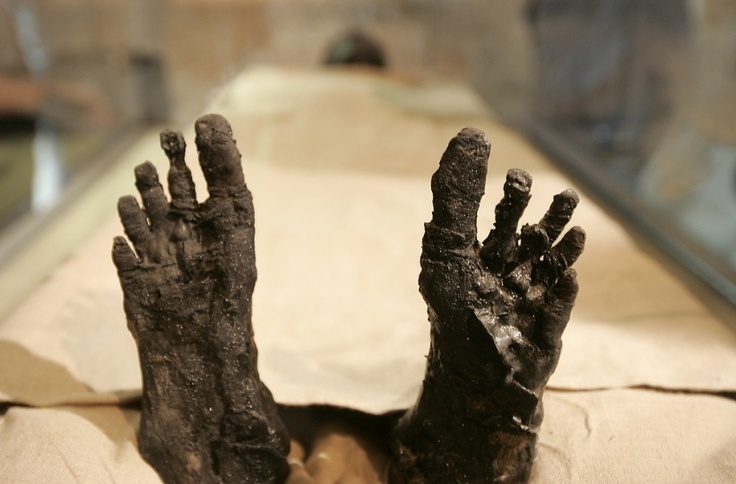 If you are talking mummies of course then Egypt wins hands down. We visited Egypt when tourism numbers had plummeted and sometimes this is a good thing. We ended up in Tutankhamen’s tomb on our own – just him and us! He was so tiny and I confess I was fascinated with his small feet sticking out from under the shroud. Many years go while visiting Madagascar I was fascinated to hear that it is a tradition to dig up their dead. It is called Famadihana and the idea is that the spirits of the dead finally join the world of the ancestors after the bodys complete decomposition and appropriate ceremonies, which may take many years. This usually happens every seven years but the practice (not surprisingly) is dwindling. 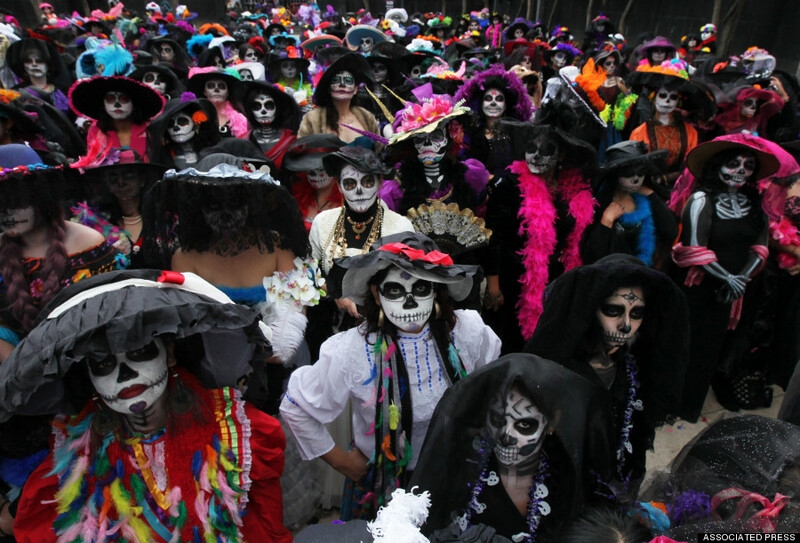 And let us not forget the Day of the Dead – mostly celebrated in Mexico. It sounds morbid but it is actually more of a celebration of the lives of departed friends and family although it has its spooky side too as many of the participants like to dress up and boy they really know how to do this. Think about the run of movies on TV over Halloween – old classics like Psycho – we loved that film so much they made it into a tv show. 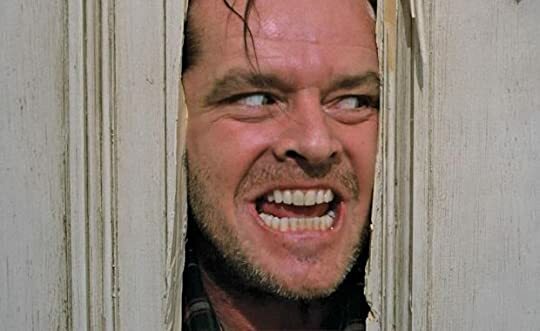 However without doubt (in my mind) no one can beat the terror of The Shining. Try watching that again and then go and spend a night in the Stanley Hotel in Colorado – inspiration for Stephen King’s Overlook Hotel where all those creepy things happened. It really looks like a beautiful hotel if you are ever in Colorado. Is it just me? I just don’t get this Halloween stuff. My grandkids would kill me. (Well that would be a real Halloweeny kind of thing to do!) They love the dressing up and of course the candy. What got me thinking about this was on my walk today around Lake Bonavista. One of the houses had really gone to town in dressing up their lawn. Omg – they had severed limbs with blood coming out and giant rats gnawing on them…… gravestones galore and severed hands in the trees attached to handcuffs. I think that’s awful. And apparently I am not the only one to be kinda turned off this whole bloody experience….. I didn’t grow up (in England) with Halloween. However we did have Guy Fawkes Day which I suppose in hindsight is also pretty awful. We would take my dad’s old trousers and shirt and stuff it with newspapers, make a mask and put on a hat and throw this in a wheelbarrow and then go round the neighbourhood asking “penny for the guy”. I suppose that’s not much different from trick or treating. We would then head down to the local park where we would have fireworks, roast chestnuts and then put the poor old guy on the bonfire and burn him “alive”….. mmmm just as barbaric as Halloween. When my kids were growing up in Swaziland, Africa, we had quite a large American community there (USAID, Embassy staff etc.). 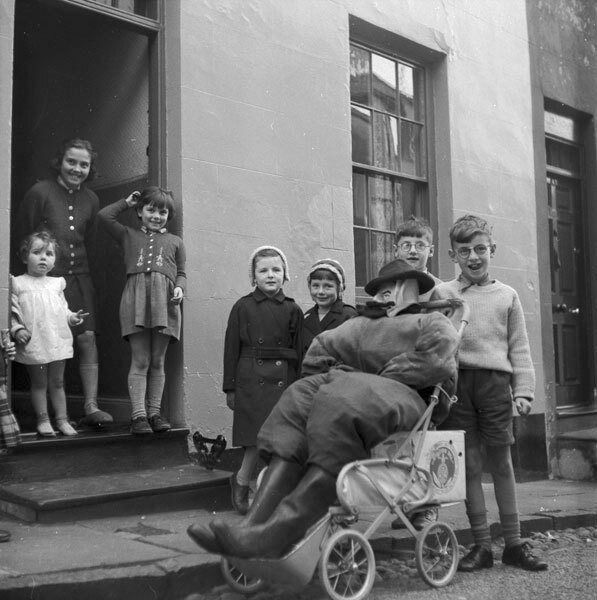 When Halloween came the parents wanted to send the kids to school dressed up. Well Mary Fraser, the principal, put her foot down firmly there. Although she came from Scotland and still had a good Scottish accent she had taught in Africa for years and was very aware of how the local Swazi people still believed in the spirit world and it was very bad luck to even talk about this sort of thing. To them this was very real and nothing to joke about. I suppose there is a little bit of the dark side in all of us. We seem to thrive on the macabre – it’s almost like the “can’t look away from the car accident syndrome”. And who am I to talk? 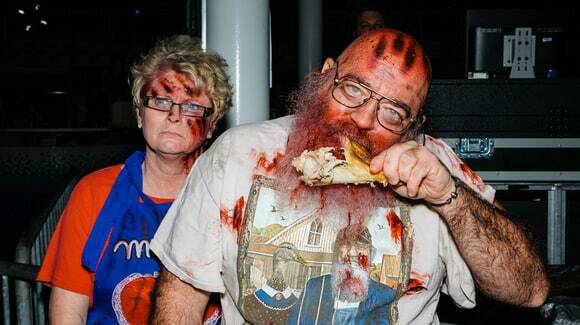 The Walking Dead fan who wouldn’t miss an episode. A shattered bottle of champagne encased in a glass showcase drew my attention. This was the original bottle used to christen the Broadmoor Hotel back in 1918. It’s a nice thought but it did look sort of creepy. Which was totally appropriate seeing as this was the place I was going to celebrate Halloween. 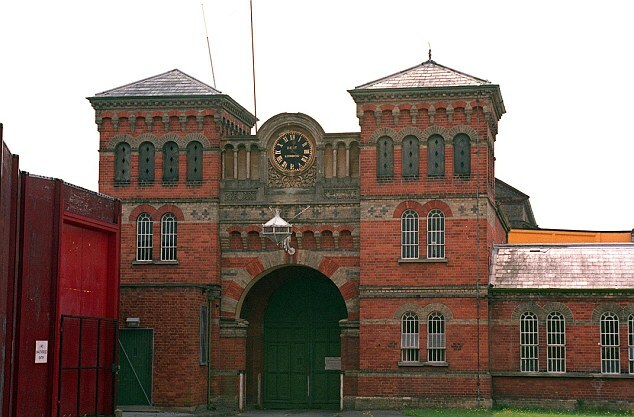 Also I couldn’t shake off this weird connection with another Broadmoor – the infamous prison in England. What started as a home for the insane, Broadmoor went on to house some of the most notorious killers in British history. Robert Maudsley, who has been compared to Hannibal Lecter, resides there in solitary confinement in a glass cell after crimes of murder and possible cannibalism. It has also been home to other charming people like Ian Brady – the Moors murderer – and the Yorkshire Ripper. Fortunately the Broadmoor in Colorado is able to boast of a better class of guest- John Wayne, Clark Gable and even lovely Prince Harry! So here I am on Halloween in a hotel that reminds me of the hotel in The Shining and even more weird the original hotel which inspired Stephen King’s novel is also in Colorado – The Stanley Hotel in Estes Park. Yes – that hotel looks pretty creepy too. Notice the reception desk …. now that’s what I call a good costume. 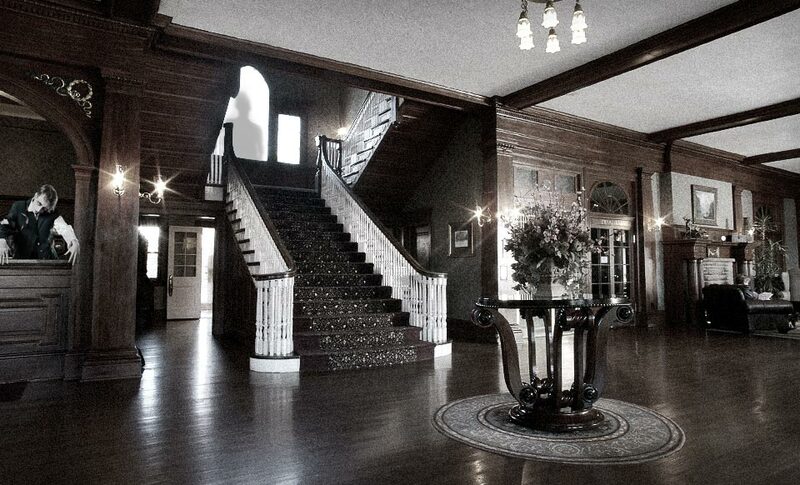 Other famous creepy hotels in the world include the Crescent Hotels in Eureka Springs US where room 218 is haunted by a ghost the staff refer to as Michael. 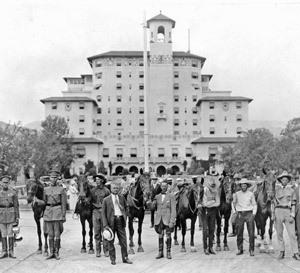 You can also try La Fonda on the Plaza in Santa Fe – haunted by quite a few including a judge. And then there’s the Hotel Chelsea in New York which is also apparently haunted – this one comes complete with closets full of skeletons. Yep – I might not sleep that well tonight. Mwhhhhhaaaaaaaaaaaaa……..